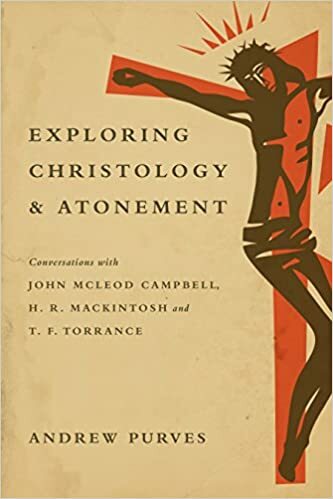 In Exploring Christology and Atonement: Conversations with John McLeod Campbell, H.R. Mackintosh and T.F. Torrance Andrew Purves unites two often divided aspects of Christology – the person and work of Christ. Through engagement with the work of Campbell, Mackintosh, and Torrance Purves shows how this Scottish “school” of theology can help shape the practice of our faith. Although Purves is clear that he doesn’t want to separate the person and work of Christ he finds it necessary to divide the book into two sections: Christology and Atonement. Under the rubric of Christology he covers the basic questions of Christology, the hypostatic union, and union with Christ all from the perspective of these three Scottish theologians (CMT). He follows the work of CMT and argues for an a posteriori account of Christology, one which beings with the revelation of God in Christ as opposed to a form of theology which attempts to do Christology by following the logic of already-held-to beliefs about God. Purves devotes one chapter to each of CMT’s theology of atonement. For each of the three theologians he emphasizes the centrality of filial rather than forensic language in atonement, the character of God, God’s opposition to Sin, the importance of including the life of Jesus into ay atonement theory, the bi-directionality of Christ’s work, and that God is not the object of atonement but rather the subject of atonement. Rather than focus on Purves’s account of McLeod Campbell or Mackintosh, I will focus the majority of my critique on his account of T.F. Torrance. Purves gets Torrance mostly right. He accurately covers his understanding of the atonement as a “mystery,” he notes Torrance’s hesitations about penal substitution, he emphasizes the bidirectionality of Christ’s work, he makes the hypostatic union a key part of his explanation of Torrance’s atonement theory, he even notes the Torrance’s views on the extent of atonement. All of this is great. But there is a major piece left out of Purves’ account – the role of recapitulation in Torrance’s theory of atonement. While Purves does not that “the whole life of Jesus, including his death, consistutes reconciliation” (227) – He fails to devote any significant discussion to the role that Patristic theology has on his theory of atonement. Torrance says that by “living all of life through the whole course of our human existence (enhypostasis), Jesus Christ achieved within our creaturely being that union between God and man that constitutes the heart of atonement. He explains that his whole life was a redemptive operation because throughout his whole life, the forces of evil waged war against him and against the union between God and man. These forces sought to “divide the human life of the Son on earth from the life of the Father above, to divide the divine and human natures in Christ himself.” In order to be “victorious” against these forces, Christ would need to live the whole human life out (enhypostasis) all the way through death and resurrection maintaining the union between human nature and God. Thus we clearly see Patristic influences upon his theology. In addition to this major gap in Purves’ coverage of Torrance there are two more general critiques that need to be noted. First it is that Purves overemphasizes the filial-relational aspects of atonement to the complete detriment of any forensic elements that are clearly there. Second, Purves fails to critically engage with any of these theologians in a substantive way. Towards the end of each chapter he brings up a few small issues he has with each theologian, but his critiques seem to be more of an afterthought. In summary – his coverage of each theologian is just a summary. There is nothing necessarily wrong with that, but its not what you would expect from a book that claims to be a “conversation” with CMT. Despite these flaws – the readers of this book will certainly come away with a deeper understanding of CMT’s position. That is something which I applaud, not only because it means that Purves represented them faithfully, but because CMT’s theology is a theology which refuses to separate academic theology from piety. Thus the reader will be thrown in to the beauty of the gospel and will (if they take Purves’s words seriously) come away with a deeper appreciation of who Christ is and what he has done for us.